1 x Heated Bed Power Module. This module under the premise of normal cooling, it work stable under (Max) = 25A, the process of using the current not exceed 25A. 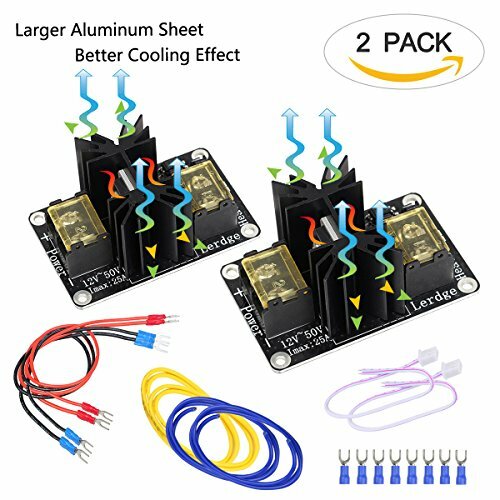 UNIQUE DESIGN: With unique snowflake heatsink design, it has a great cooling effect. The heat bed power module can be used in both Lerdge motherboard and other 3D printer motherboards. 25A MAXIMUM CURRENT: This high power module helps your 3D printer equipped with the Lerdge controller board become even more powerful. The module can solve the current load problem when the heated bed power is too large. With this add-on module to board lead the maximum current up to 25A. PACKAGE INCLUDES: 2 x Heated bed power module (motherboard is not included) and 2 x Connection cable for input signal. BONUS: 4 x Power cables.